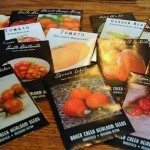 When buying vegetable plants for the garden (starters), what is the difference in buying a plant that says organic vs. one that isn't. Is it the potting soil the plant comes in? They charge more for the non-organic. I will only eat organic and use organic methods. Just want to understand the difference. It can mean one of two things. The most likely is that the non-organic was grown in potting soil that had chemical fertilizers and possibly were treated with a chemical pesticide. Organic would not have been. The second possibility is that the organic seedlings were grown from organic seeds, meaning the plants the seeds were harvested from were grown organically.